A coworker that commutes from Brooklyn was telling me about this hot new game, "Everyone is playing it. They connect brightly colored lines or something. It's very popular on the train." It didn't take long to discover what she was talking about. 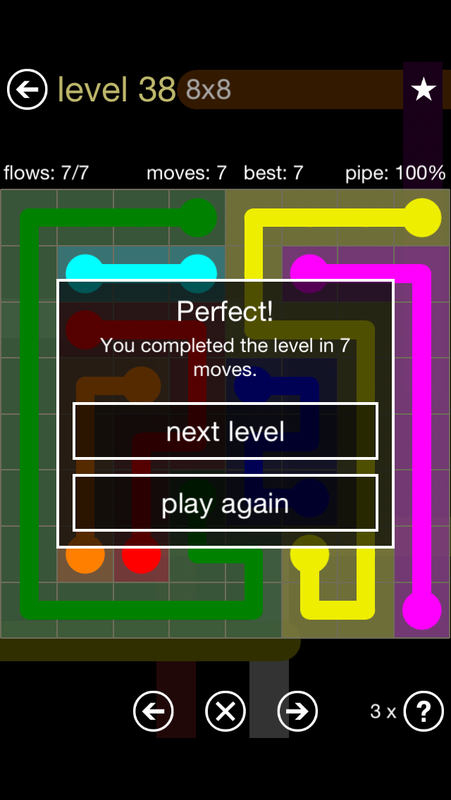 Flow Free is a free (ad-supported / DLC-supported) puzzle application for touchscreen phones (it looks like the game is available on all of the major platforms). The game has a simple concept - connect like-colored nodes and fill the entire grid without intersecting. 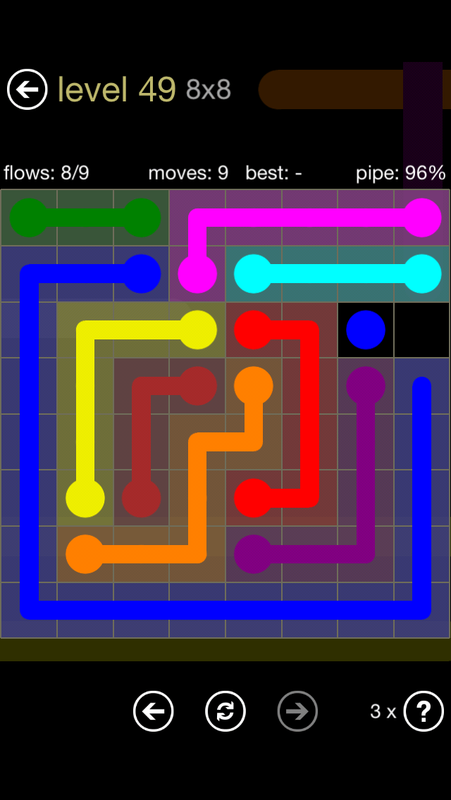 Each puzzle has a single solution (I presume some of the larger grids have a couple of options, but not many), and the game is elegantly displayed with bright colors on a black background. I didn't want to start with Flow Free. I have a rule about free games, which is that I mainly don't play them. I don't like looking at ads and I can be skeptical about DLC. I understand the "try before you buy" model, but I trust reviews enough to know what I'm going to like. And normally, iPhone games are only one dollar, so I can afford to make a mistake every now and then. Instead, I started with Flow Free: Bridges. This variant by the game company included a single "bridge" in the puzzle. The reviews were incredible. The game was one buck with no DLC. I was pretty happy with the prospect of a new puzzle game. I obsessed over the Cut the Rope puzzles until I finished all of those (and the "Experiments" pack). I did the same with Train Yard. This was my next challenge. Let me start with a major positive—Flow Free: Bridges (and Flow Free) are beautifully done. The game is very responsive to the player's touch. I have had few, if any, clumsy finger mistakes and even when I did, there is an undo button when you stray too far from an acceptable path (in other words, you disrupt one path with another). The interface is great once you're inside the game and it's pretty. I could easily see why people seem to love the game and why my coworker would be commenting on it. 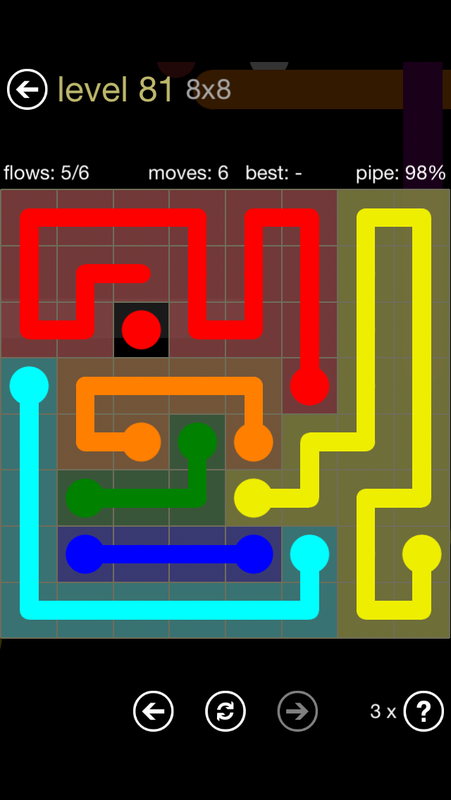 You cannot mistake Flow Free for any other game. The bright colors on the black background look awesome. Flow Free: Bridges was not a challenge. Not one bit. I kept thinking the game would get harder, but it didn't. It was as if I was reading a book, not playing a game. Each page, I was presented with a variation of the puzzle and each one was solved in mere seconds. I finished all 300 levels perfectly in a single day - while traveling and doing work. The game was so easy, in fact, that I thought that either (a) I was some sort of genius or (b) the appeal of the game is how simple it is. Maybe this game is not about being a puzzle at all, instead it's a distraction. I never felt this way about Train Yard, which presents similar gameplay to Flow Free: Bridges. Train Yard puzzles get progressively harder. Sometimes, I would have to put the game down for a couple of days before loading it back up to solve a single puzzle. 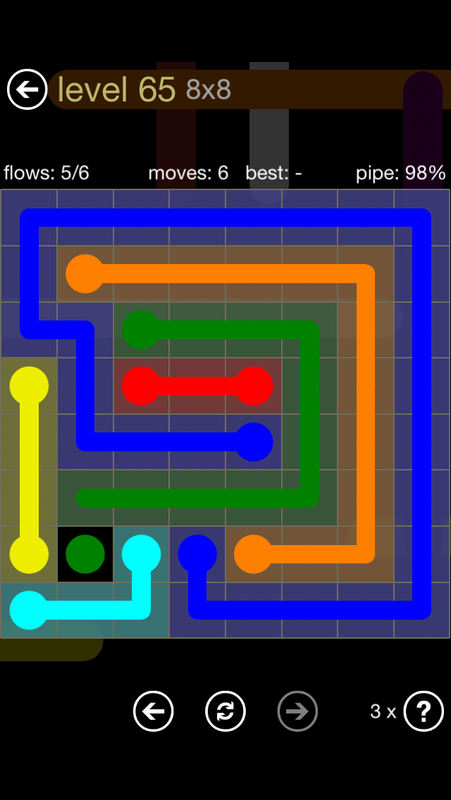 The problem with the game is that the pipes have to fill the entire square. Every single space needs to be occupied. That means that in every level, there are assumptions that have to be true. Once you fill in the pipes that are obvious, the rest of the paths become clear. The more you do it, the better you become, so when there are larger grids they aren't necessarily harder, they are just about the same. And that's frustrating! I wanted "Hard" to actually mean something! 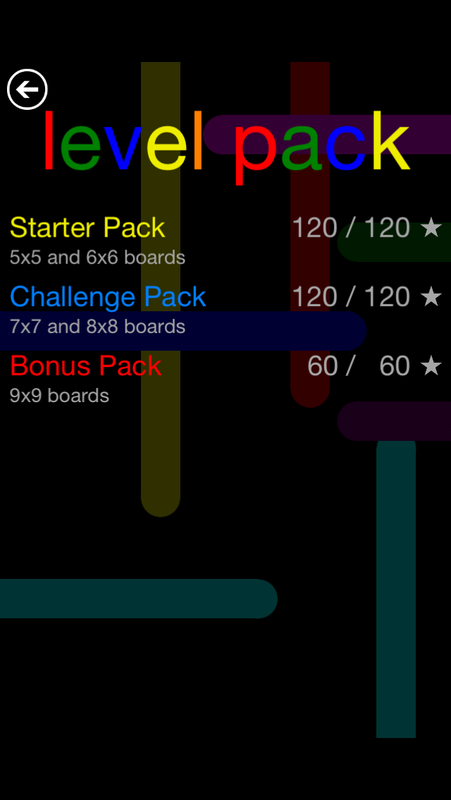 I was annoyed with Flow Free: Bridges and so I downloaded Flow Free and bought all of the DLC. I quickly beat the standard levels and then started to dive into the other packs. The level structure of Flow Free is different of that than Bridges. In Bridges, everything is placed in the optimal way. Every line is tightly packed into the grid. There are no squigglies or unnecessary knots. Most of Flow Free is that way as well. 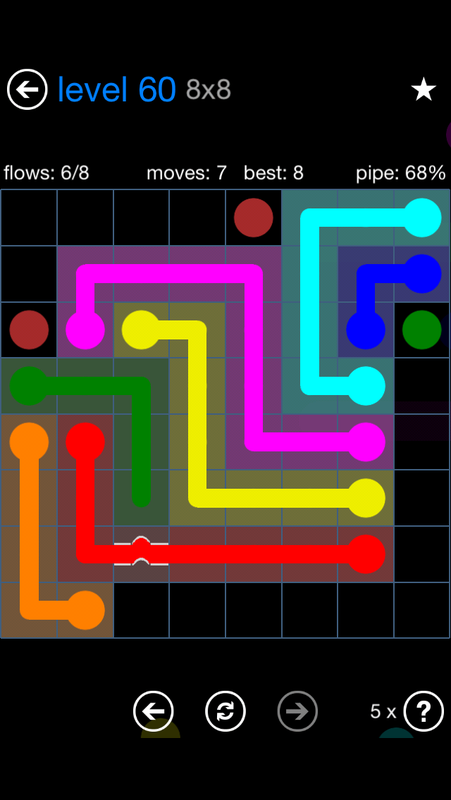 But sometimes, Flow Free will throw in a puzzle that has squigglies all over it! Those curve balls are the only type of level that gave me pause. When you can make assumptions about where things have to be in a puzzle that's completely tight with only a single solution, introducing lines that zig and zag all over the place to take up space is a new dimension of difficulty, because it challenges my initial assumptions of how the space is dealt with! For instance, I would start with any straight lines that needed to be made or any lines that went around the edge of the space. Then I would examine the remaining nodes and figure out what needed to go around what in order to connect everything nicely. In these squiggly levels, I would do that and then realize that there's tons of empty space. Then I'd have to go back to the beginning (because I want the perfect number of moves) and accommodate for all of that extra space. To be fair, I have only the Regular Pack and most of the 8x8 Mania Pack on Flow Free. I'm building up to the 10x10 Mania Pack which I anticipate will have the greatest challenges, although I doubt the game designer can throw much else out there at this point. Train Yard was so difficult because at the toughest moments, there were very few obvious moves. Two or three different variations make the puzzles incredibly trying on a player's ability to predict the future. Flow Free, though, doesn't have that freedom. There are just some things that have to be and once those are discovered, the level is basically solved.